Summary of today’s show: As we observe the 40th anniversary of Roe v. Wade and the 40th annual March for Life this week, Scot Landry and Fr. Matt Williams sit down with Dr. David Franks and Jaymie Stuart Wolfe to talk about Massachusetts Citizens for Life’s annual Assembly for Life in Boston this Saturday, which will see former Planned Parenthood clinic director Abby Johnson talk about her conversion from pro-choice to pro-life. They also talked with Marianne Luthin of the ProLife Office about the important work of bringing healing to post-abortion women through Project Rachel and the Holy Hours for Life organized in 150-plus parishes with the help of the Office for Deacons. 1st segment: Scot Landry welcomed everyone to the show. Fr. Matt Williams and Scot talked about the upcoming March for Life and pilgrimage including live photoblogging from George Martell at BostonCatholicPhotos.com and a live recording of The Good Catholic Life from Washington, DC. There’s also a plan to provide live video from the March itself at BostonCatholicLive.com. Fr. Matt said they have over 500 people going and each year the Catholic Media Secretariat has been able to provide more and more ways for those who stay behind to participate with the pilgrims. They discussed the logistics of bringing all the pilgrims to DC. Scot welcomed Dr. David Franks, who is the chairman of the Mass. Citizens for Life, and Jaymie Stuart Wolfe, who will be the emcee on Saturday for the Assembly for Life. Jaymie said she has laryngitis and will be struggling to talk. David said he is also taking three of his children along with the seminarians from St. John Seminary on Amtrak to Washington, DC. David said the seminary sends the seminarians as a crucial witness for life and to provide them with the exposure to the amazing experience. David said his young children, pre-teen and younger, are excited to be part of this massive witness to the most basic of freedoms. They have traveled to the March in the past as well. He said the children love the youthful energy from all the hundreds of thousands, especially where they don’t see it in their everyday life for such a countercultural cause. Scot asked David when and how he has the conversation about abortion with his children and why we need to have a witness for the protection of human life. David said it is pervasive throughout his household and the way they raise their kids. The witness is always there in how they live their lives. He said the children go to Mass and see the crucifix and the bleeding Corpus of Our Lord and Savior. Life is filled with death and sacrifice and the greatest act of love is intertwined with death and sacrifice. They are exposed to the terms and when they are at the development stage where they ask questions, then they give them the answers appropriate for their developmental stage. Jaymie talked about talking to her eight kids about abortion. She said she and her and husband have grown in their appreciation and understanding of the Church’s teachings on life and the children have grown with them in that. She explained how she phrased it in terms that the children can understand without being too graphic. Scot asked Fr. Matt what work is done to prepare the middle schoolers and high schoolers who go on the pilgrimage to understand abortion. Fr. Matt said they all know why they are going down to DC. They know that abortion was legalized 40 years ago and that we have a duty to be a witness for those who have no voice. He said they have three distinct tracks for middle school, high school, and young adults to help them process all that they will see and hear. They will hear multiple speakers and then experience the walk and they will flood their mind and senses. They will begin to process what it means to them. On Friday night, before the Blessed Sacrament, they will integrate everything for themselves. Scot asked about the 40th annual Assembly for Life at Fanueil Hall at 2pm on Sunday. David said that it’s important for pro-lifers to be organized. MCFL is the largest grassroots pro-life organization in the Commonwealth. He admitted that since the early 1990s there has been a massive drop-off in membership in all kinds of civic organizations. They’re not sure why that is, but think it maybe connected to a rise in consumerism and more online connectedness. He said we need to be actively engaged in civi life if we’re going to transform our culture. The Assembly is always held around January 22 at Fanueil Hall, which has been a cradle for freedom. We have a proud history in Massachusetts of civic ideals and principles of human rights and dignity. Jaymie said the event will be reflective because of the 40th anniversary. They will toll bells for deceased pro-lifers, say the Pledge of Allegiance, and then hear the story of Abby Johnson, a former director of a Planned Parenthood clinic who left are seeing the reality of what she was doing. She will tell her story, which shows how God reaches even into the pit of hell to save us. There will also be some musical performances. Dvid said Abby is a prayerful and thoughtful speaker with an insider’s view to the culture of death. That is powerful because conversion is powerful to see. When we see conversion, we see how Christ has saved us. Jaymie said it’s important to speak from the perspective of our eternal life. We’re created for something greater. Sin and death lead away from Christ and it’s important to hear the witness of someone who has turned away from the road and back toward Christ. She said Abby’s been spending her life since her conversion helping rescue people who are trying to leave the abortion business. They often feel trapped by their choices and unable to leave. David said they hope that Abby’s presence will draw in people who haven’t heard of the Assembly before. A speaker of this calibre doesn’t come along very often. He thinks she recognizes that if we can change Massachusetts, we can change America. With the defeat of Question 2, we have seen what the Holy Spirit can do. He encouraged listeners to join MCFL and come see what they can do to effect change. David said he focuses in his talk with people in favor of legalized abortion on the basic principles of human rights. The basic principle is I should be as free as I can be right to where I cause harm to another. In fact, abortion causes harm to the most powerless of human beings. Last week, Jaymie’s column in the Pilot compared her laryngitis to the voicelessness of the unborn. When we deny personhood to anyone in any state or at any stage, we deny humanity. A human person is the end. We do not dispose of human beings for another end. There’s something wrong with a law that degrades womanhood and turns a mother into a death chamber for her children. It’s dehumanizing to women to cast them aside as sexually available and with pregnancy easily solved with cash or credit. David said the goal of MCFL is to restore the right to life of those who are powerless under the law. They seek to speak for the voiceless. They do this in various ways, but the basic work is to foment a dialogue in the culture: Why is it we say social justice, solidarity, and preferential option for the poor and think it’s compatible with the slaughter of the most innocent human beings. They win the book A Body in Prayer by Neil Combs. 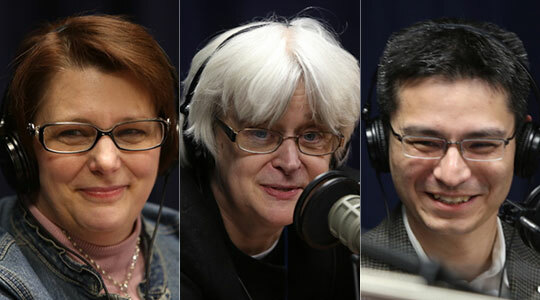 3rd segment: Scot welcomed Marianne Luthin of the ProLife Office of the Archdiocese of Boston to the show. He said the archdiocese provides both education on the issues, but also direct help to men and women who have been affected by abortion. Marianne said Project Rachel is an outreach to men and women who have had past abortions. She said as the anniversary rolls around, women who’ve had abortions often are confronted by their choice, up to 40 years ago. Marianne said so many people don’t know about Project Rachel and many of the women who reach out to them hear about it for the first time in the parish bulletin. She said the bulletin is their number one referral source. Even a pamphlet is hard to promote because they are afraid someone might see them take one. Marianne said they hold retreats throughout the year. Many of the women who go on the retreat say they’ve confessed their abortions, but find they can’t forgive themselves. On the retreats they hear the stories of other women who’ve gone through the same thing. Marianne said everything about the retreats is confidential, including the location of the retreats. She said the upcoming retreats are Feb 2, March 16, April 6. To contact them, their phone number is 508-651-3100. Or email them at help@projectrachelboston.org. She said the retreats are specifically for women who’ve undergone abortions themselves. She added that one of the reasons some men and women have left the Church has been due to participation in an abortion, and this is a way to bring people back to the Church, especially in this Year of Faith. Scot encouraged listeners to mention to their pastor that they’d like to see the bulletin announcement in their parish bulletin and that it should run as often as possible. Marianne said women have said women have told they needed to see it more than once to act on it. Scot said the ProLife Office is also working with the Office for Permanent Deacons to organize Holy Hours for Life in parishes. Marianne said they started five years ago. Part of the mission of deacons is to preach and this is a natural extension of that mission. The Holy Hours will take place in 150 parishes this year and has become a tradition throughout the archdiocese. Marianne commented on the 40th anniversary of the March for Life and how it has grown and become much younger in the age of participants. It has truly become a witness for life. Young people today are even more pro-life than their parents today. Marianne pointed out that technology has changed how we see abortion. When Roe v. Wade came down, they didn’t even have ultrasounds. Scot noted that many parishes are having baby showers for life. Marianne said over 100 parishes are participating. It started with one woman who couldn’t go to the March. Parishes collect goods for the use of women in crisis pregnancies.